What was initially planned to be a 1 night stay turned out to be a trip of 4 nights in Turin. And I must say that even though the city centre of Turin is relatively small, but with so many things to see and marvel at, a visitor like me will need at least a month here. 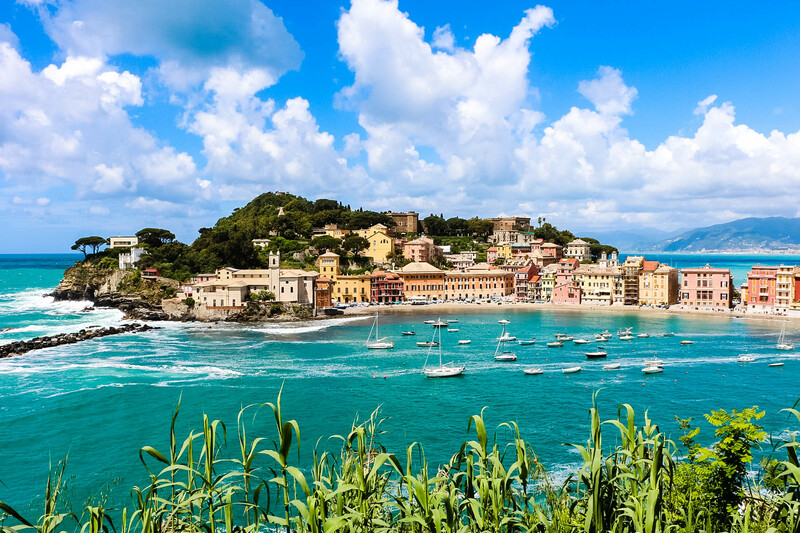 Catch my next article introducing this elegant and green Italian city whose photos of the Mole with the Alps towering majestically behind have stolen my heart as well as many others. 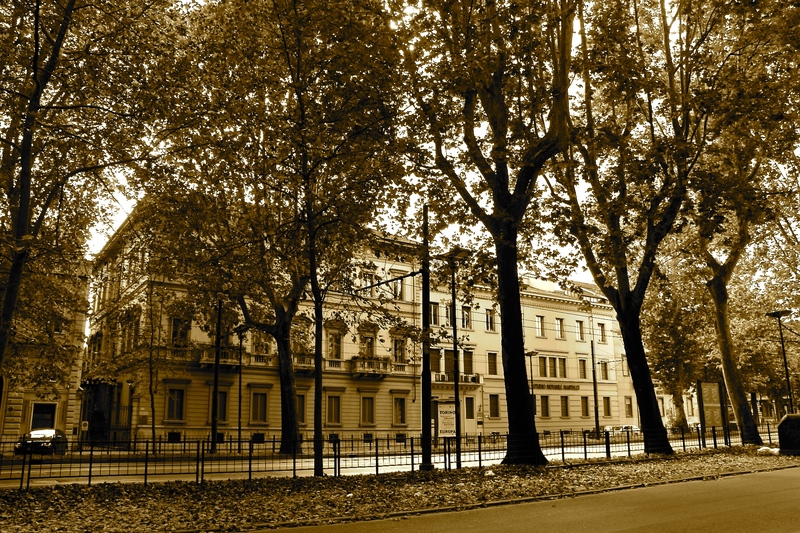 Rows of trees line along the streets of Turin. This must be the most green city in Italy. Before we go into the winners, let us look at some helpful tips that will aid you in choosing the right B&B for your future trips. 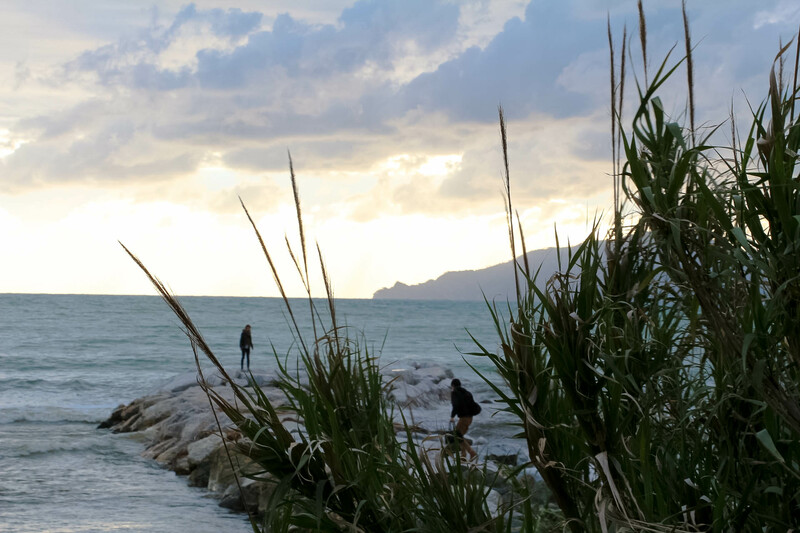 B&B offers a localised experience with a personal touch, whereby one gets to stay with a local host and be engaged in meaningful conversations that will increase one’s understanding of the place and her people, and plentiful of helpful suggestions on what to see, eat and do. Unlike a hotel or a commercialised lodging, B&Bs usually are the apartments or houses which the host also live in, or live close to, hence they take pride in keeping the place clean and comfortable to allow guests to feel good. Service comes from their heart and it is nice to have someone whom you can approach for any advice or help if needed. It can be a good way to experience how do locals live and see the architectural as well as historical aspects of the buildings. Also, incidents of theft are definitely much higher in hotels as all sorts of toms, dicks and harrys can pose off as one of the employees or guests, and it is not alarming that even some of the employees themselves are dishonest. Whereas in a B&B, the host’s reputation is at stake and there are not too many culprits to suspect. How does one determine which B&B to stay? The best website that I find is Tripadvisor where the reviews by past clients are more or less credible and there are photos posted by the reviewers of the B&B that are crucial in forming an impression of how the B&B kind of looks like. 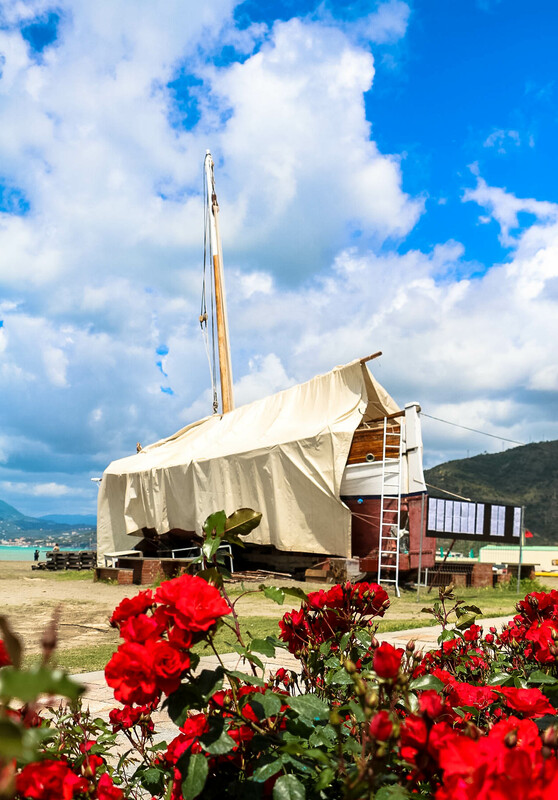 Once the photos and the reviews seem favorable, the next step will be to search for their website and contact the B&B for room availability and price. However, don’t be fooled by the number of reivews a B&B has. Some real gems simply may not have that many reviews written. In general, going by the tried and tested logic, most people would prefer those with more reviewers in order to feel more assured. 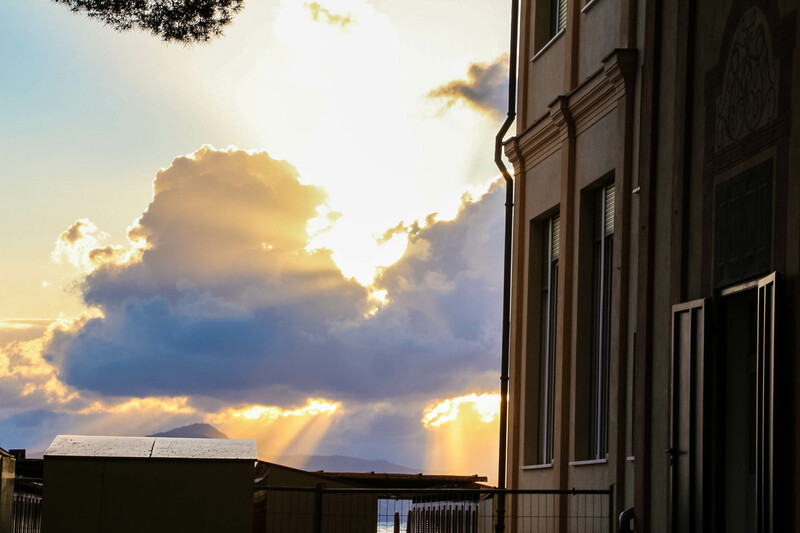 Since the previous article was on Sestri Levante, I would like to introduce to you this wonderful B&B which I fell in love with after seeing photos of it and the great reviews about the place and the host on Tripadvisor.com … B&B PIAZZA ITALIA (http://www.bbpiazzaitalia.it/en/). 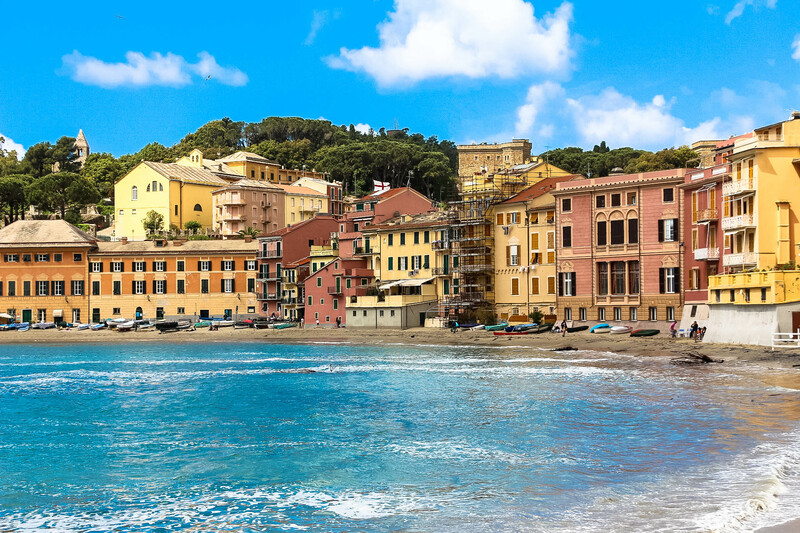 Not surprising that it is the top B&B in Sestri Levante. The photos here serve as a testimony of my wonderful and unforgettable stay there, and I look forward to be back again, and be pampered. 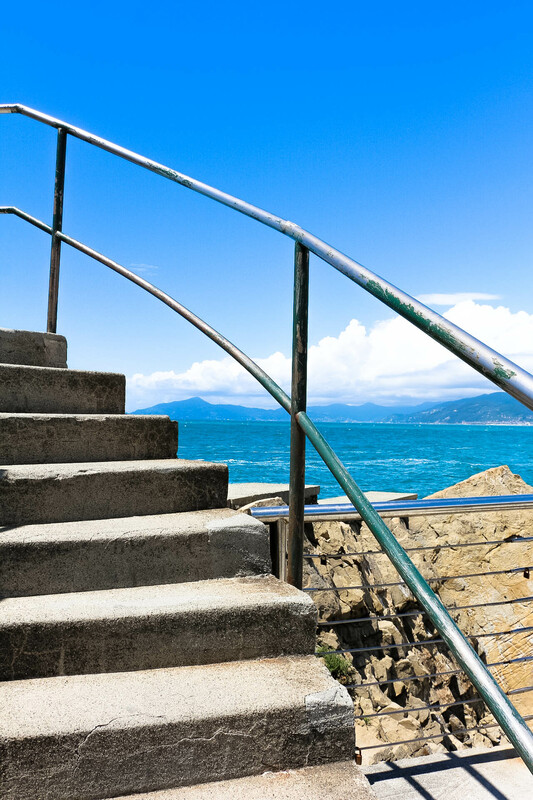 Conveniently located with just a few steps away from the Sestri Levante train station, the entrance to the B&B is below this short flight of stairs. Wonder what is behind the glass windows? 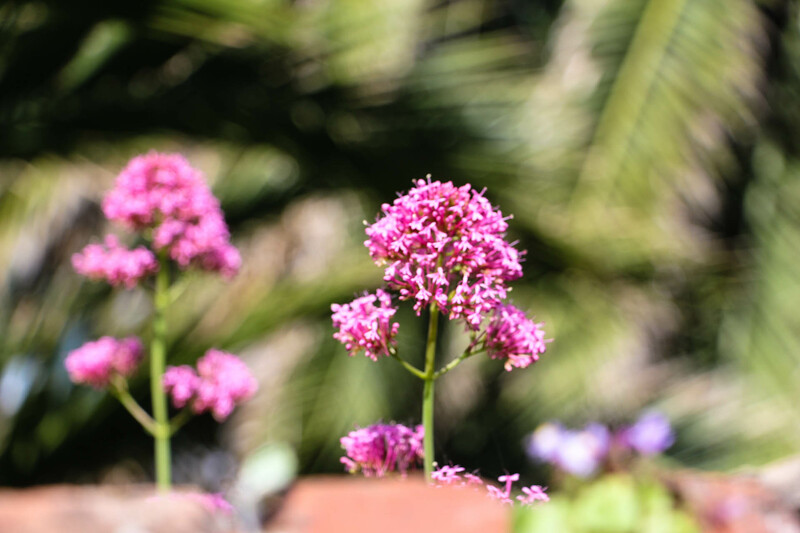 The whole compound surrounding the house is a garden, with beautiful flowers like this. Alessandro even grows roses which some might have been used as part of his decorative works in the B&B. When I arrived at the start of the stairs, Alex was there waiting for me with a BIG smile and helped me with my luggage. I was already half-alive having woked up very early in order to catch the train which took me about 4 hours of ride. I was greeted by Alessandro’s mother, a very lovely woman as I came into the living room which is also sort of a reception area. I was in awe of the warm ambience and the good mix of classic with modern interior design that exude an elegant feel. I sat on the extremely comfortable sofa while Alessandro went to get me a cup of tea. Thereafter, he gave me a tourist map of the town and introduced very enthusiastically the places and events that should not be missed. 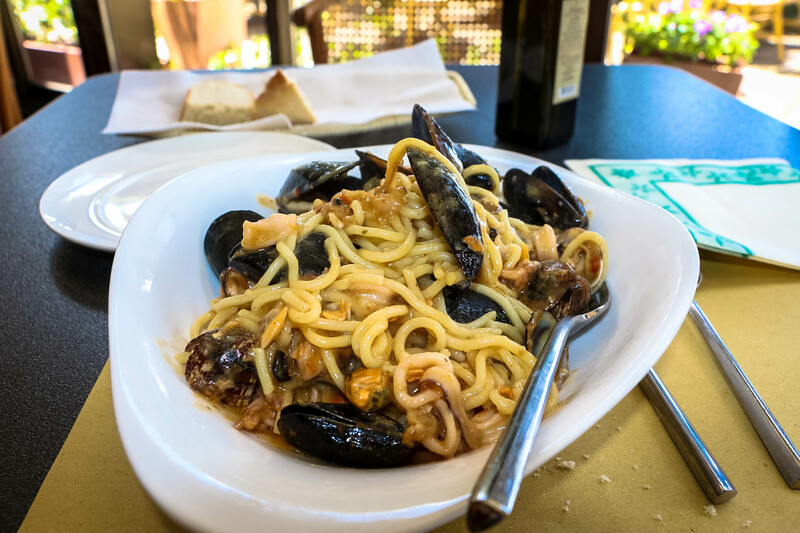 He also recommended some trattorias that serve good and unpretentious local cuisine that offer discount if I mention that I am a guest at B&B Piazza Italia. I had to hand it to him for being so genuinely enthusiastic going through this despite having done so countless of times with other guests. White is the main choice of color of the furniture and furnishings, with some black to give definition and sophistication. Well, not when they are half-used. But here is an exception, and even the candle holders add a touch of elegance to the layout. … and the bigger box has beautiful fresh roses, with a Renaissance putto beside. Many a time, simple elegance like this is enough. Just by looking at the living room, one can already tell that Alessandro is a man who pays great attention to details with care, leaving nothing uncovered. So guests can feel confident and comfortable staying at the B&B. Fresh flowers represent sincerity and can you feel the warm and sincere hospitality of Alessandro already? Classical art. This is what I call real taste. Alessandro creatively put some Italian sweets for guests to feel free to take and try. One of the few roman classical human busts add a touch of refined beauty to the B&B. Not forgetting thèse 3 cute pine cones placed in candle holders. According to Alessandro, this house built in the early 20th century was destroyed during the bombing of the second world war. The original hand designed stucchi decorations, ancient doors and floorings have been restored. Behind the door in the living room opens to another living room! What beautiful light shade! The feeling that one gets is that of stepping into a cosy familial area. Alessandro is indeed a man of creativity and talents, with a fine taste for all things beautiful. He gets his decorative items mostly from his travels and antiques markets. Importantly, he knows how to mix and match them and lay them out in such a way that is classic elegance that makes guests feel at home. Alessandro said that in his family, the womenfolk were masters in lace sewing by hand. It is not hard to understand why they were masters of their craft. Look at how intricate the stitchings are! Beautifully laid out dining table with fresh roses in the middle, all done up by Alessandro himself. As I arrived before checked-in time, and was feeling and must had looked tired and hungry, Alessandro invited me to the pantry area to have some breakfast. I was amazed by the selection of pastries, bread, fruits and beverages that I could help myself with. I had genovese focaccia, which was one of the most deliciously unforgettable. Alessandro even shared the recipe on making the focaccia. The beautifully and precise lay-out of the cutlery and serviette shows how much care and attention to detail Alessandro has paid to give his guests a 7-star B&B experience. Seriously, I was reluctant to use them. After having worked as a chef for 20 years, cooking should be his second nature. Look at the yummy-licious biscuits he has prepared and kept cruchy in these cute glass containers. Not too sweet, they were just right for the health-conscious like me, and enough to satisfy the sweet-tooths. Where could be a better place in a B&B than the dining area where people get to bond over food? Alessandro was very kind and friendly who will always do his best to be present, and chat with guests, asking if they had a good sleep, etc. Alessandro and his very lovely mother are always ready to help. A smile and kind gestures are more than enough to communicate to the heart, transcending spoken languages. 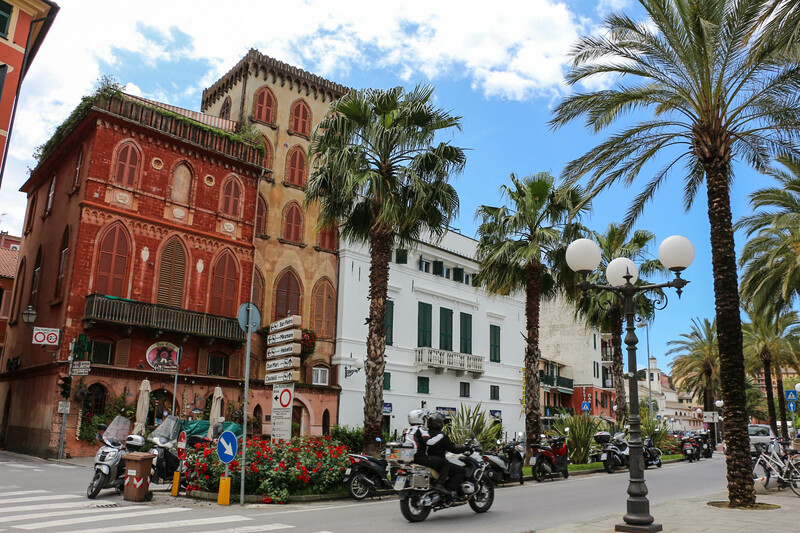 For B&B Piazza Italia, generosity is THE word to describe it. Generous food and beverages throughout the day in the pantry/dining room, generous hospitality from Alessandro and his mum, and now, inside the room, complimentary regional wine. How generous is that? As a further testimony to Alessandro’s merticulous care and attention, I left the unsuccessfully unscrewed cork as it was the night before, disappointed that I was unable to savor it before I turned in for the night. The next morning, while Alessandro was doing house-keeping in the room, he noticed my failed attempt, and kindly placed a new cork which I was able to just pull it off later that evening when I returned. scent of fresh roses fills the room the moment I walked in. Thick curtains decorate the beginning of the doorway to ensure guests have a good and undisturbed sleep at night or simply to provide privacy as well. Luxury can be expressed by simplicity. Nothing too opulent here. Just simple bed, drawers, and classic french bed side tables. … at the classic french bed side table which I like a lot. Double-glazed big windows that open out to a view of the garden outside and sky above. Here, the bed is a luxe. White sheets and hand-sewn covers with lace by the ladies in Alessandro’s family. Going through this sweet lace work with my fingers, I wondered how many heads that had rested here knew about this precious heritage? 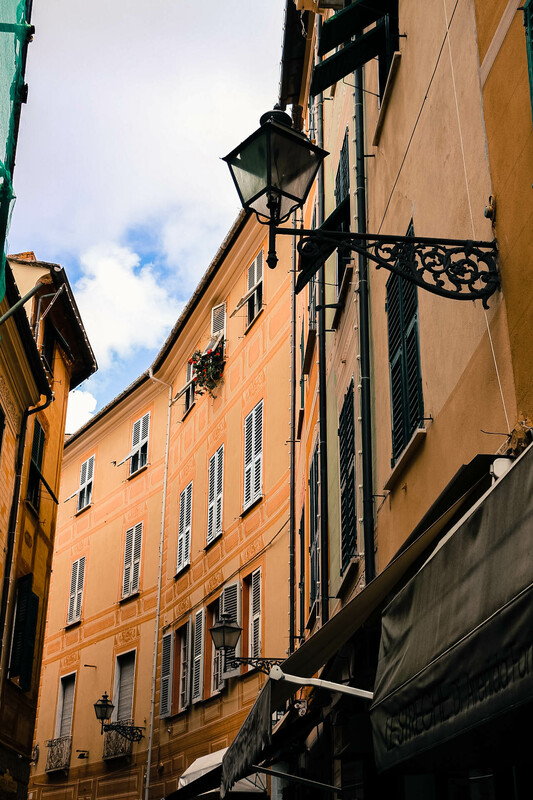 After a day out in the sun, as I returned to B&B Piazza Italia, it felt like returning home as I stepped into the living room, illuminated by soft yellow light of the classic styled lamps. In the words of Alessandro on his motive for having this B&B, “I want to create a corner whereby my guests may discover wonderful surprises in the little details that I take great care and attention to make their stay memorable.” Thank you Alessandro, you have made my stay in Sestri Levante and Italy an unforgettable one. I asked Alessandro, the amiable owner who has a natural flair for interior design, to share about his experience in setting up and running the B&B, and what motivates him to always keep that smile and energy despite at times, is a tough job, especially when he has to do the house-keeping after guests checked-out. “I started out as a cook in a hotel for about 20 years. It was over this period of time there that I ‘breathed the atmosphere of the hotel’. 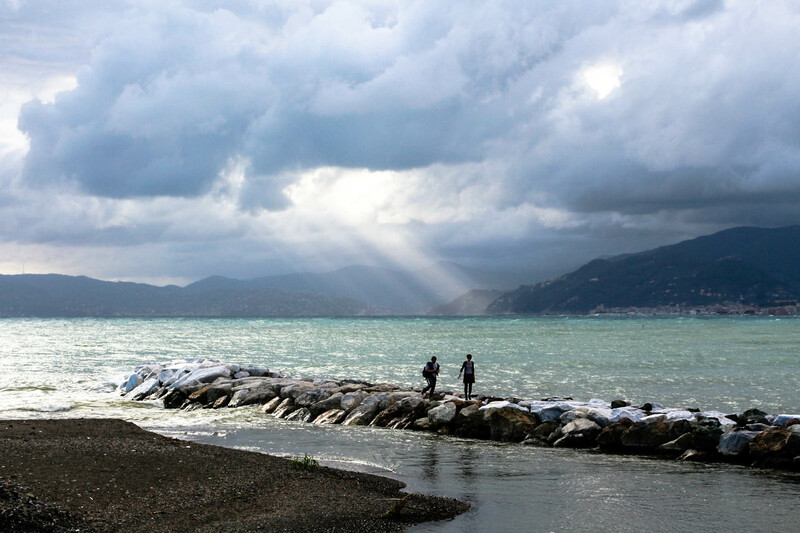 That was where my desire to offer something different and more refine on the land of Sestri Levante developed. So about 10 years ago, I opened my first B & B “CA ‘DU ALE” (http://www.caduale.it) which is a couple of kilometers from the city center. Though it is a simple place, careful attention is given to every single aspect of hospitality in order to ensure our guests have an enjoyable stay. But, I desired to do more, like something that can combine historical value with genuine hospitality. 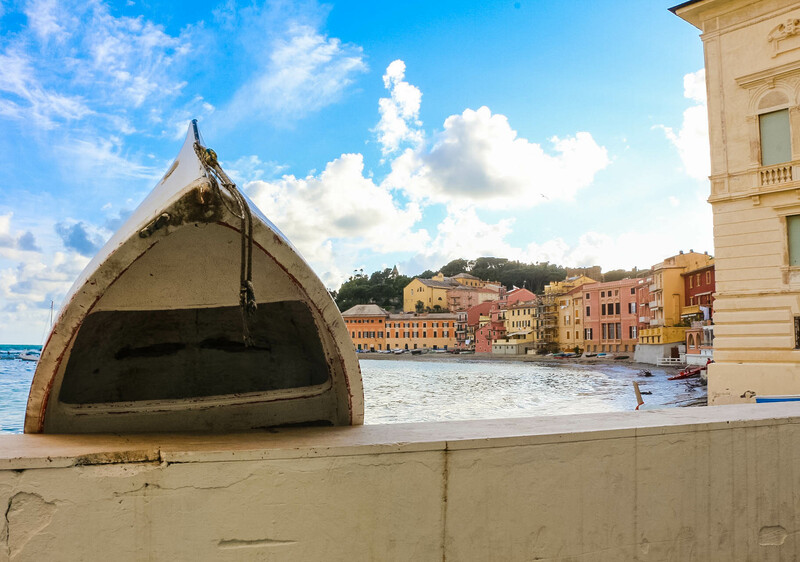 And so about 4 years ago, I decided to open the doors of another house that is part of the history of Sestri Levante, to all who love refined beauty and wish to experience the simple life and spirit of Sestri Levante’s town, nature and people. 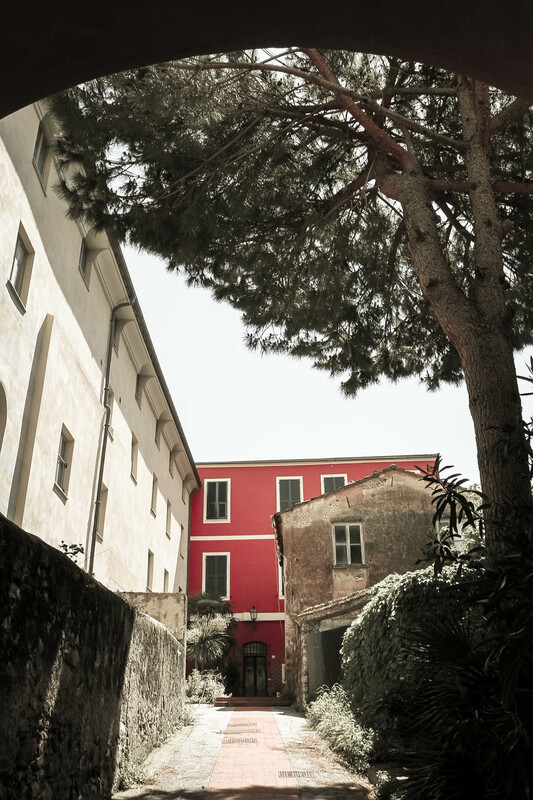 Here at B&B Piazza Italia, is where elegance blends with the traditions and local flavors of my territory. 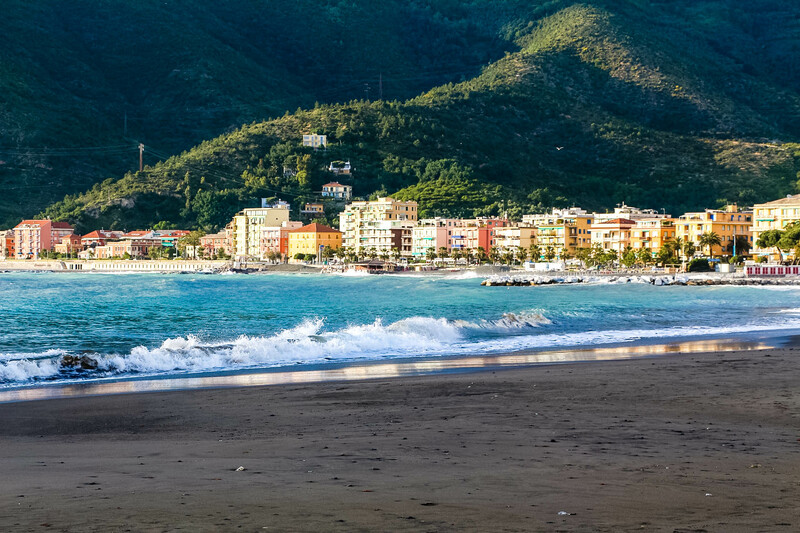 One of the most beautiful coastlines in the world has got to be that of Italy, from the Italian Riveria starting from Ventimiglia to all the way down to Sicily. 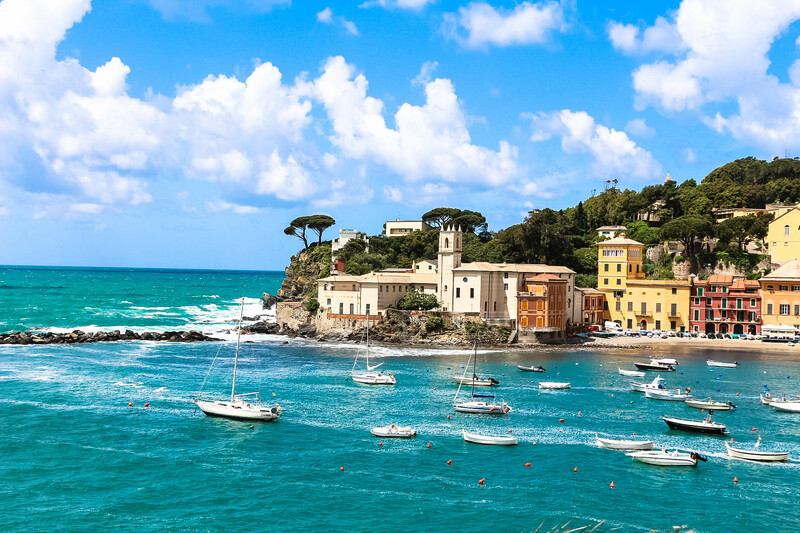 Picturesque coastal villages built on the rocky slopes of the mountains, warm pastel colored buildings and the colorful fishing boats docked on the shores, what a sight to behold! 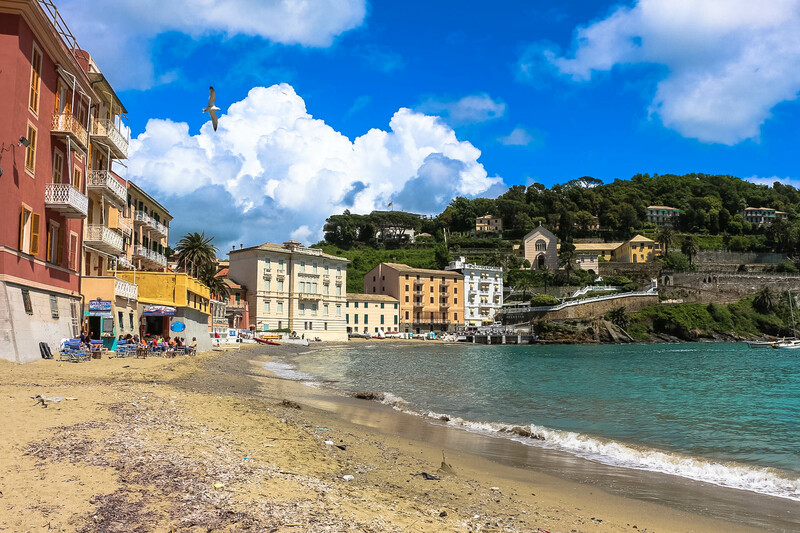 For some reprive from the loads of tourists that flood Cinque Terre, take a local train westwards to Sestri Levante which is about 30mins ride from Monterosso with fantastic coastal views. Here the town is built on low lands along the shoreline. 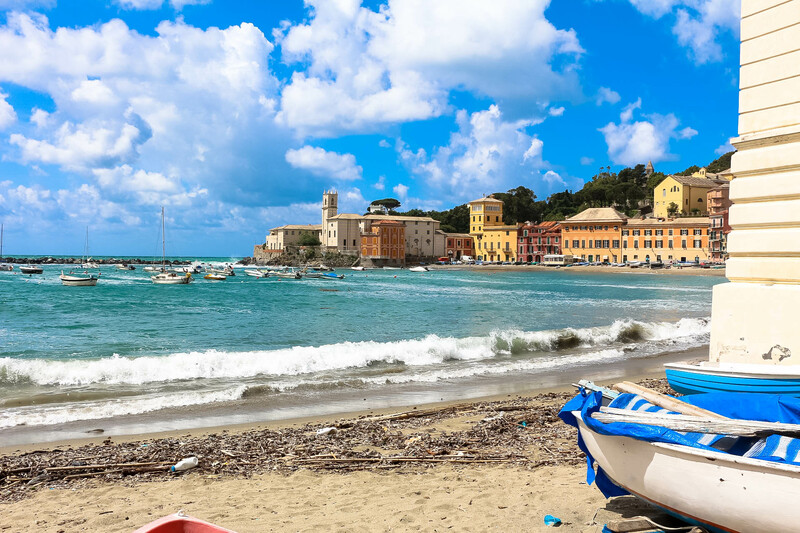 Perhaps some might find it lacking the awe inspired as compared to all 4 other villages with the exception of Monterosso al Mare in Cinque Terre and those along Amalfi Coast, Sestri Levante is by no means a destination to be missed. 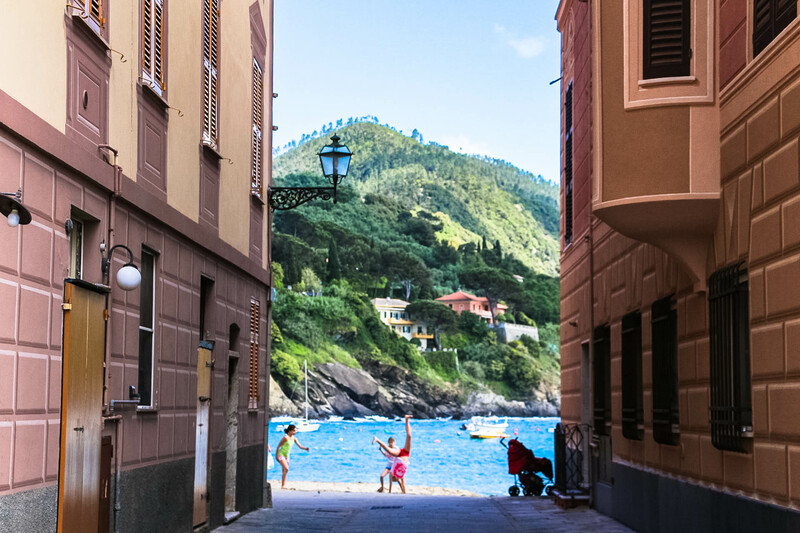 Here, you will find more Italians than tourists, and this place comes alive during the weekends when young Italians, many as families taking a weekend break from a hectic week. 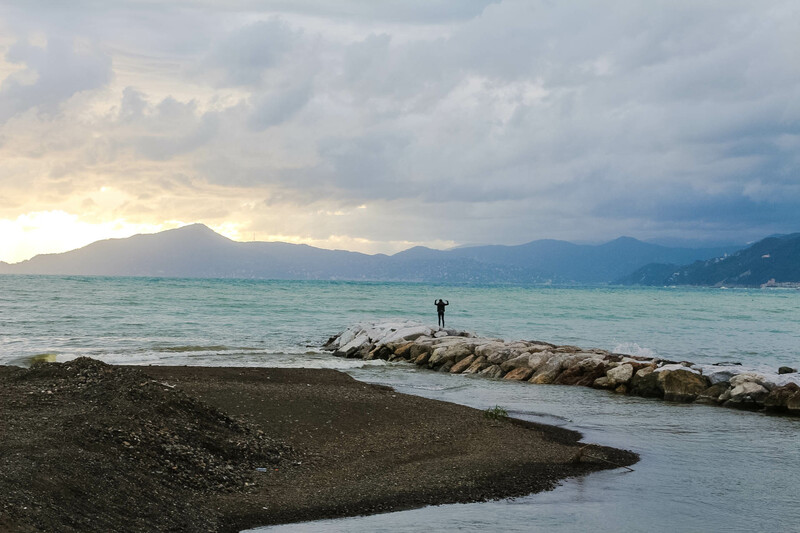 During the weekdays, it is calm and peaceful, and is easy to strike a conversation with the retirees to learn about the town, fishing, and sometimes even more interesting topics like politics or family. 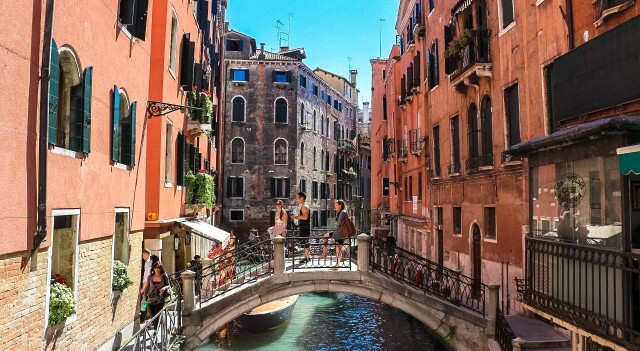 The best period to visit is between May to June, and end September to early November where the weather is pleasant, and accommodations are at a low peak rate. What’s best? You can practically be the one of the only few tourists without being disturbed. 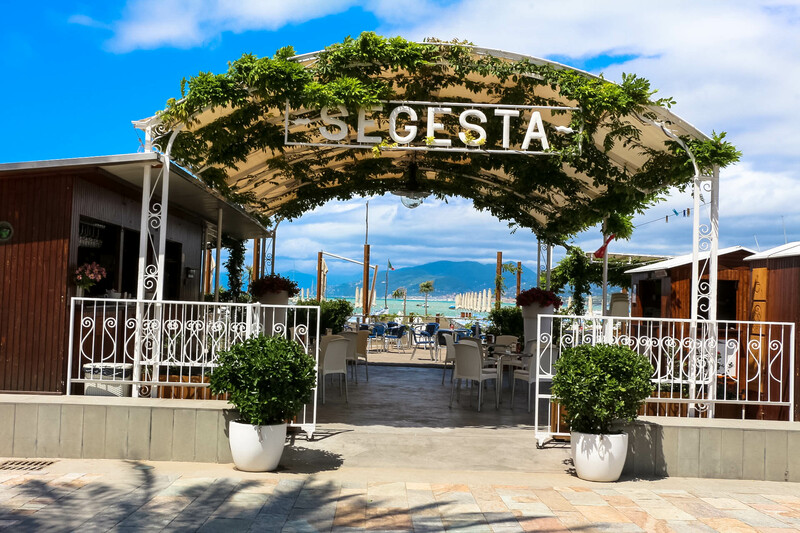 Restaurants by the beach become alive in the evenings and on the weekends. Bathing facilities and beach chairs are available for the tanners. But as it was in spring time and a week day, it probably explains why no one is around. Grey clouds in the distant with wind blowing towards my direction. Rain, rain! Go away, come again another day! 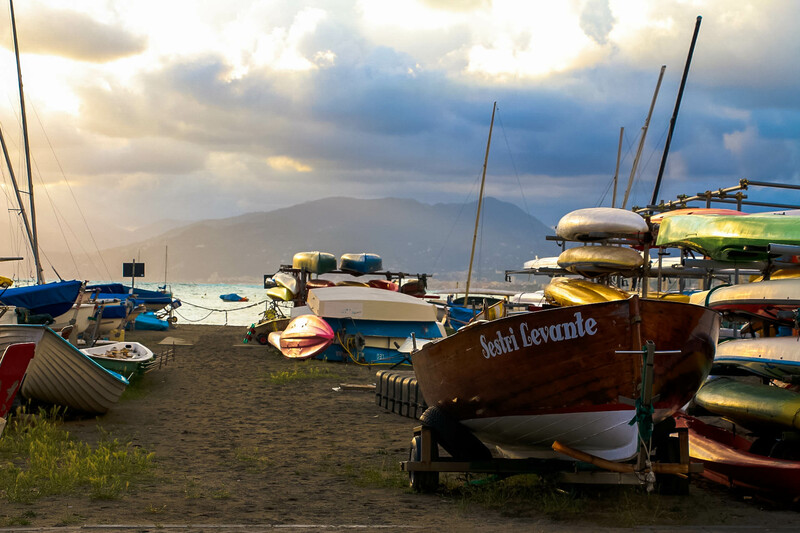 Rows of fishing boats on the beach. Take your pick! 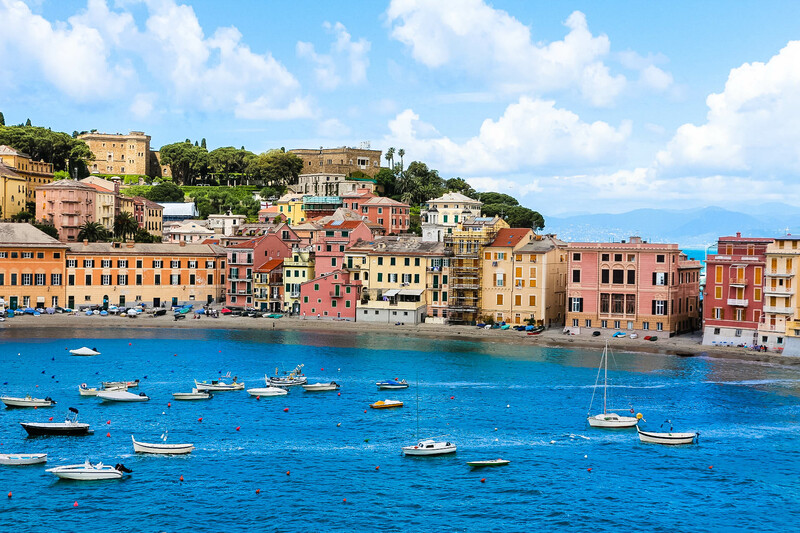 Old town of Sestri Levante is built on a thin stretch of peninsula like a cresent moon with 2 beautiful bays. 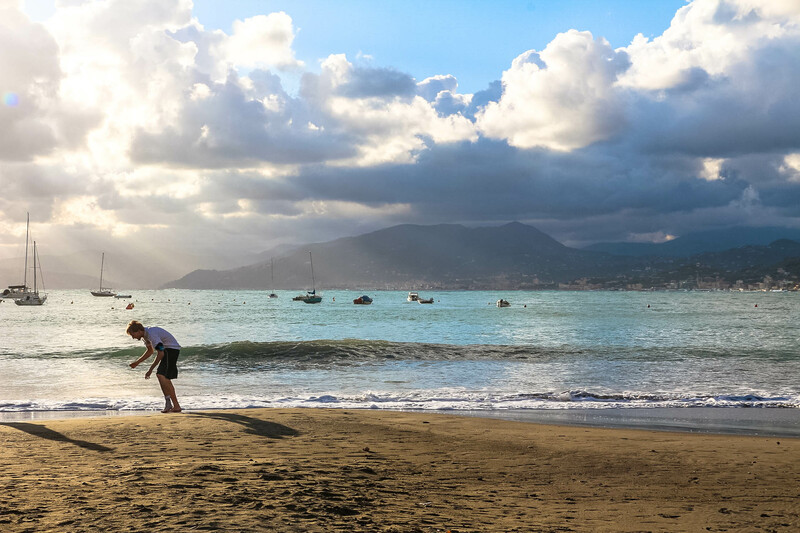 1+1 = Sestri Levante! 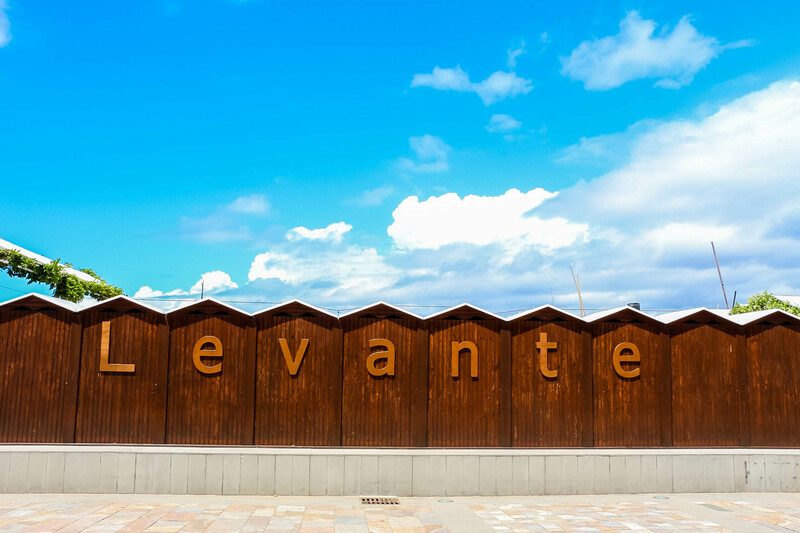 How can one miss it when the town’s name is spelt in big alphabets on the back of the cute shower huts on the beach of the Bay of Fairy Tales? 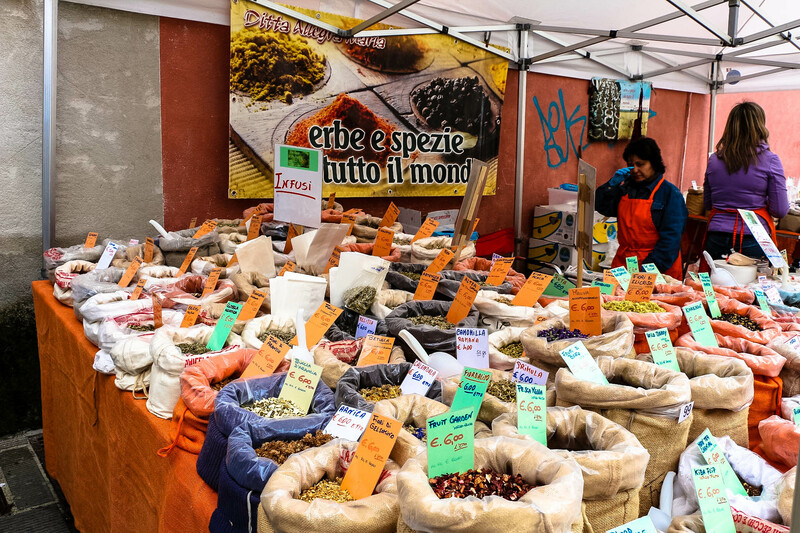 I love the open-air markets where I can get to immerse myself in the local culture and get to see many locally produced products like wines, handicrafts, olive oils, cakes, fruits, etc. I particularly love the spices and herbs stall as the lady was very funny and allowed me to try the spices. You will be amazed you can get curry powder here! Yes, I did bargain and succeeded! 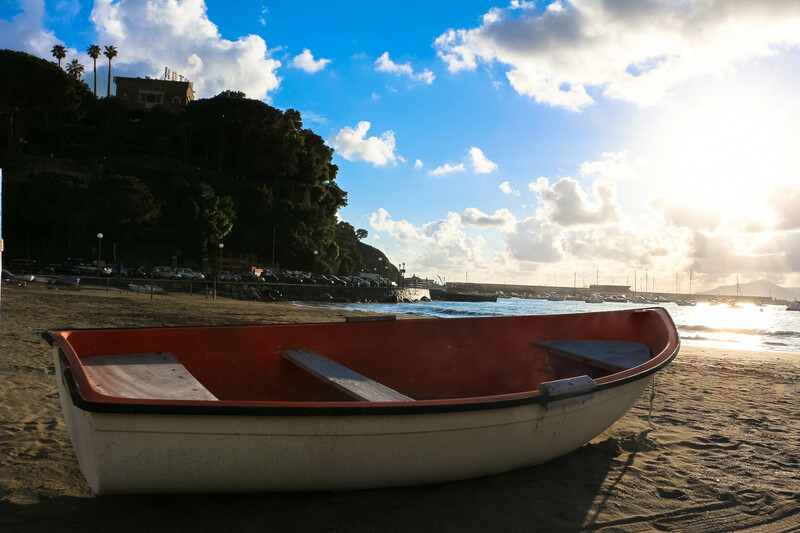 There is something really cute about these fishing boats, don’t you think so? 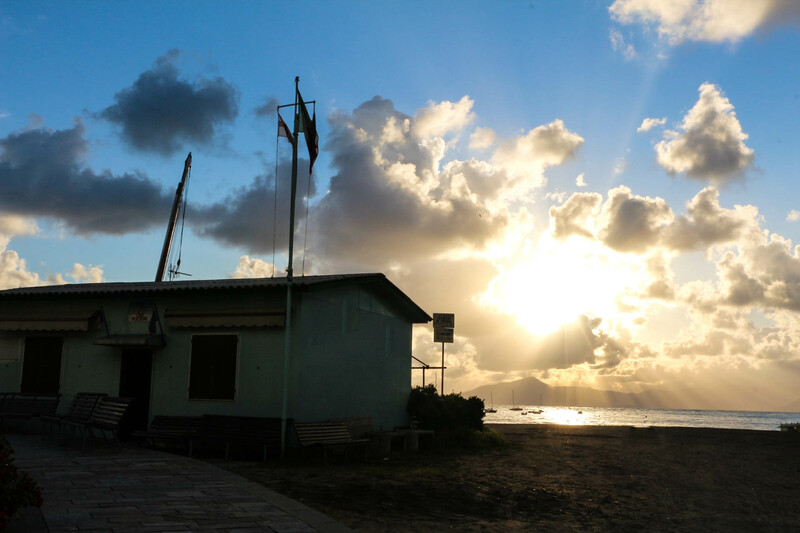 Walk along Via Pilade Queirolo, away from the jetty and up the slope and voilà! 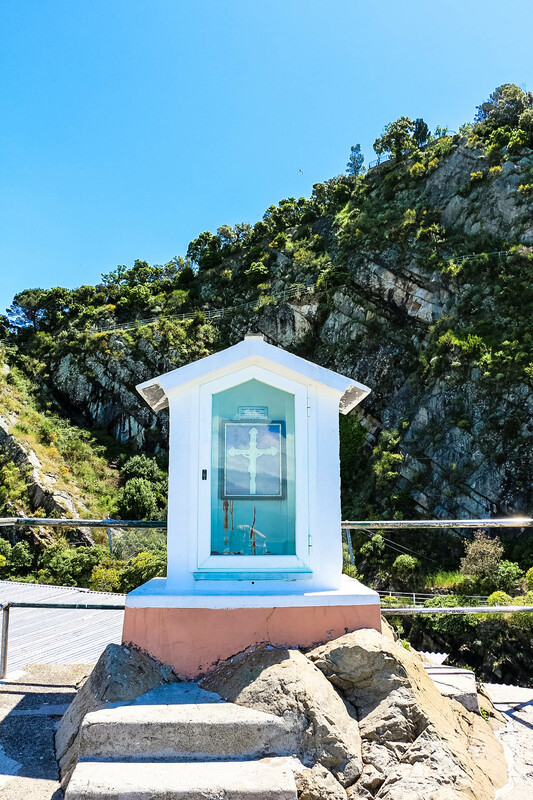 You will notice there will be a cross facing out to the sea at coastal towns because locals were/are generally Catholics and this is for protection of the seamen and the town from storms. 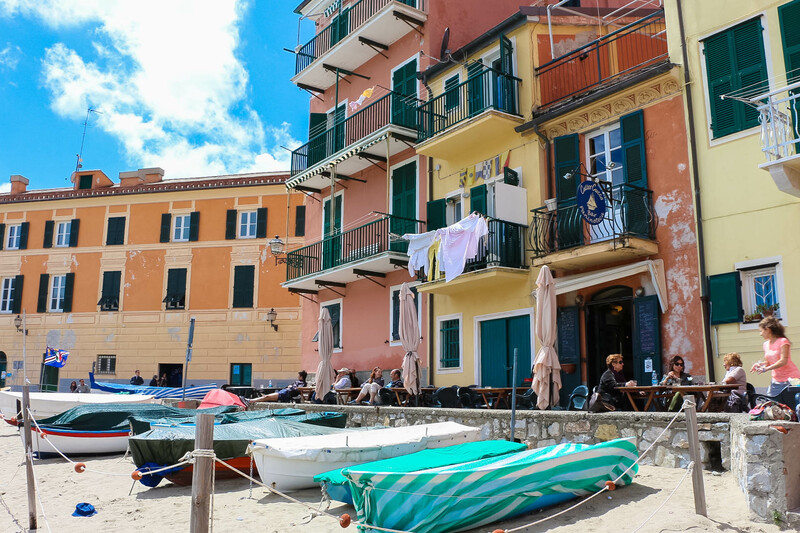 There are quite a number of B&Bs in the old town and one can simply just stay in one of these buildings with a balcony overlooking the Silent Bay and have a delicious meal right below! Small fishing boats powered by a small engine like these generally do not take up much space and are easy to ‘park’ on the shore. Sneak peak at SIlent Bay. 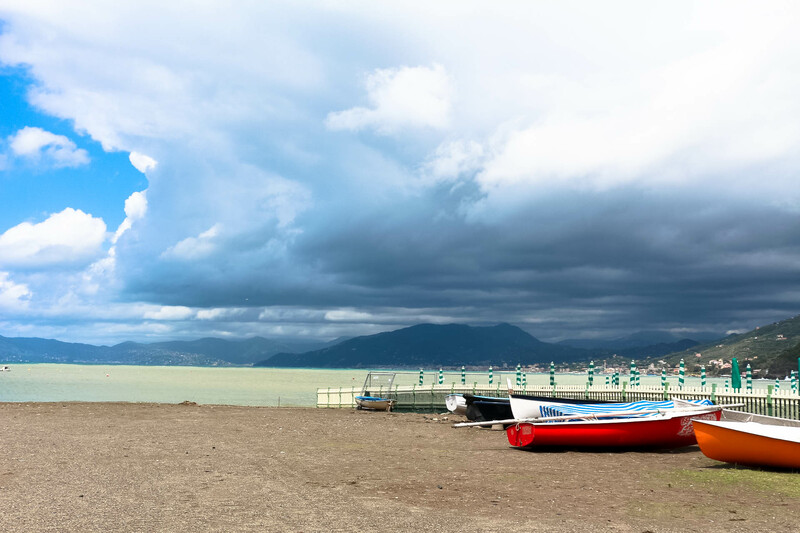 During low peak season, you could just have almost the whole bay to yourself and a few others! Is not difficult to leave your footsteps in the sand now, isn’t it? Silent Bay or Baia del Silenzio, a very narrow strip of sandy beach where the buildings are practically next to the shoreline. Not much space left for sun-tanning especially with the fishing boats there. This German woman, who is a mother of 2 has such fab body that will drive most women green with envy. She must have known about my admiration and hence that bright smile! Silent Bay indeed living up to her name. 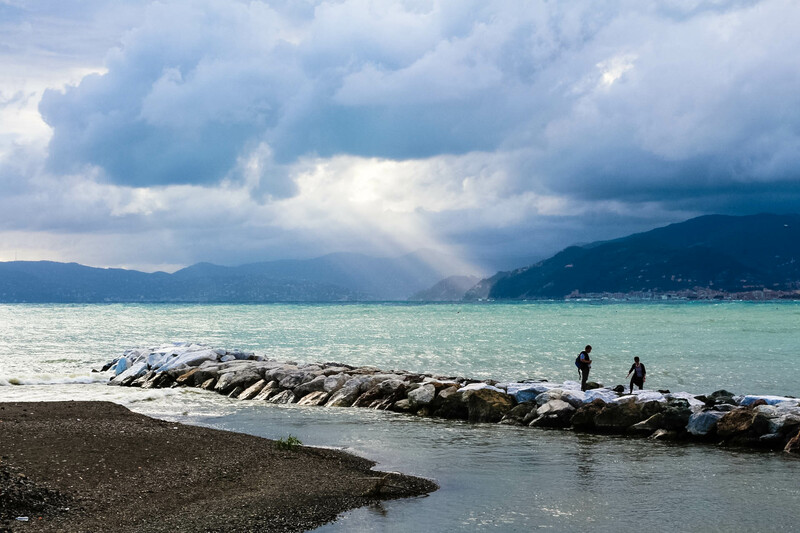 Silent Bay, in a semi-circle form, walking along the shoreline will bring you to the upper part of the mountain where one can find a hotel and a church, and fantastic views of Silent Bay. 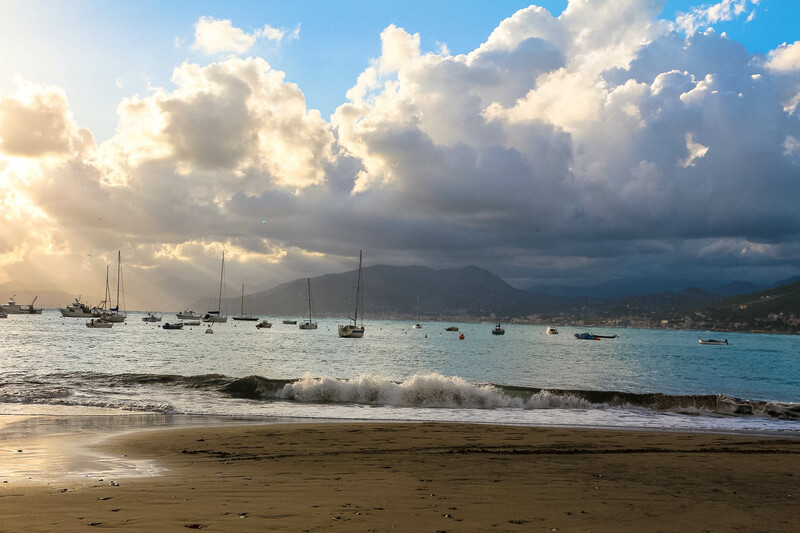 More boats on waters of Silent Bay, but they are more for leisure sailing. 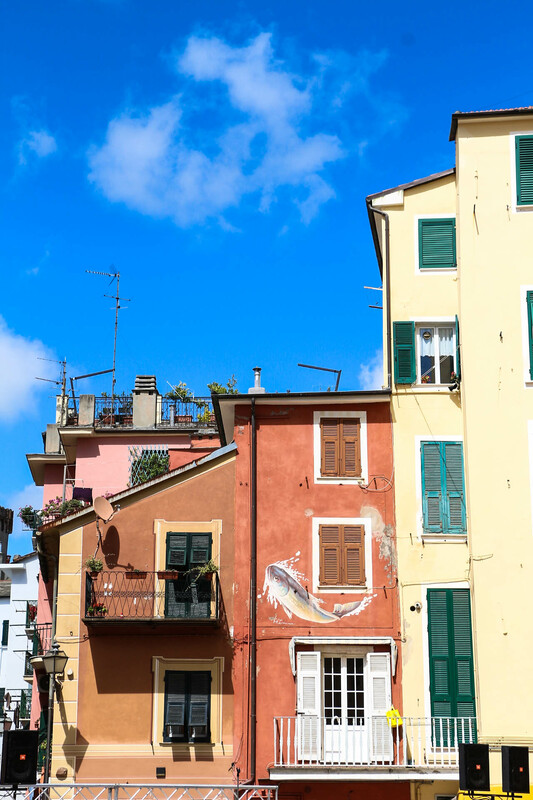 Part of the charm of Italian coastal towns are their narrow alleys in between pastel colored buildings. You will never know what to expect! 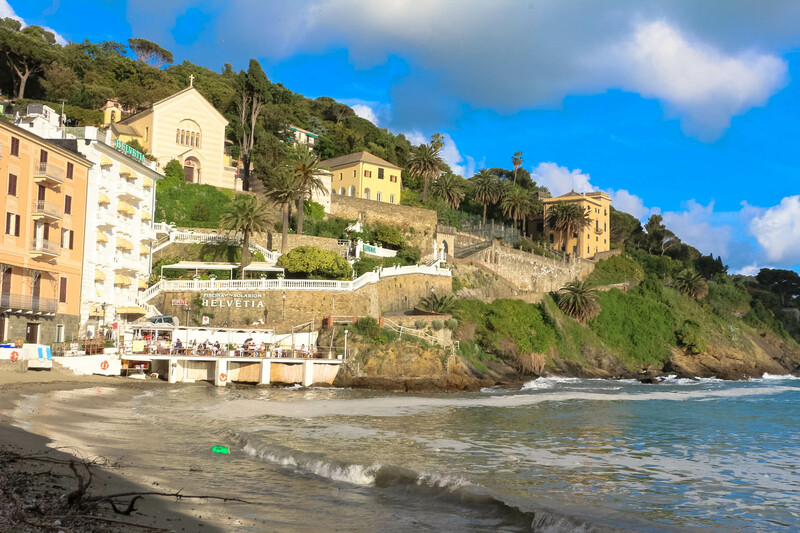 As you ascent up the slope of Via Penisola di Levante, breath-taking views of the town below and opposite greenery await you. Hidden surprises along the steep walk, where there are some hotels tucked up in a hidden santuary. 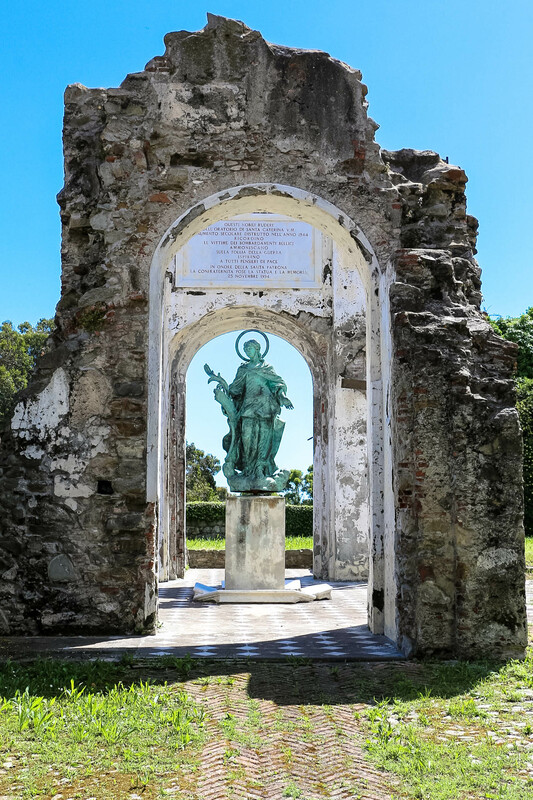 This is what is left of baroque-styled Ruderi Oratorio Santa Caterina after a bombardment in WWII in 1944 and this statue was erected in memory of those who lost their lives during the war. 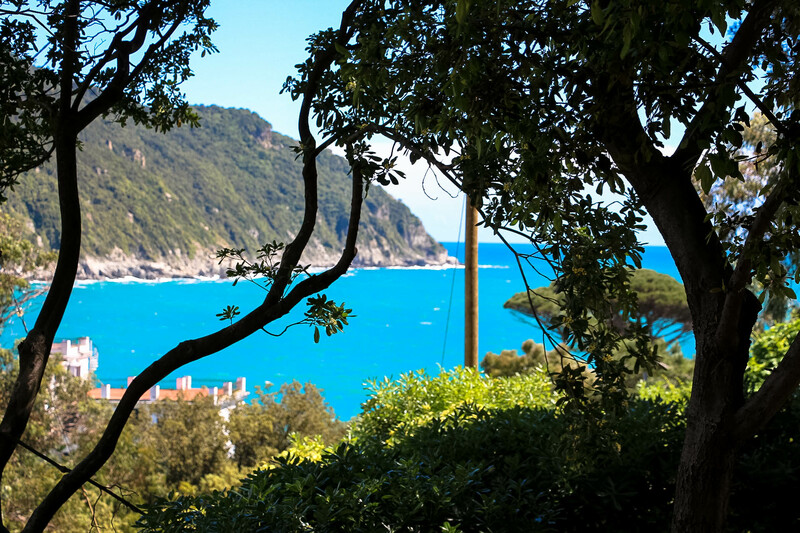 Sneak peak from the woods above Church of St Nicolò dell’isola. Romanesque style characterised by unpolished stones that set the church and the pointed arches. Looking at the architecture in detail, notice the bell tower has belfry windows where the church bells would ring. 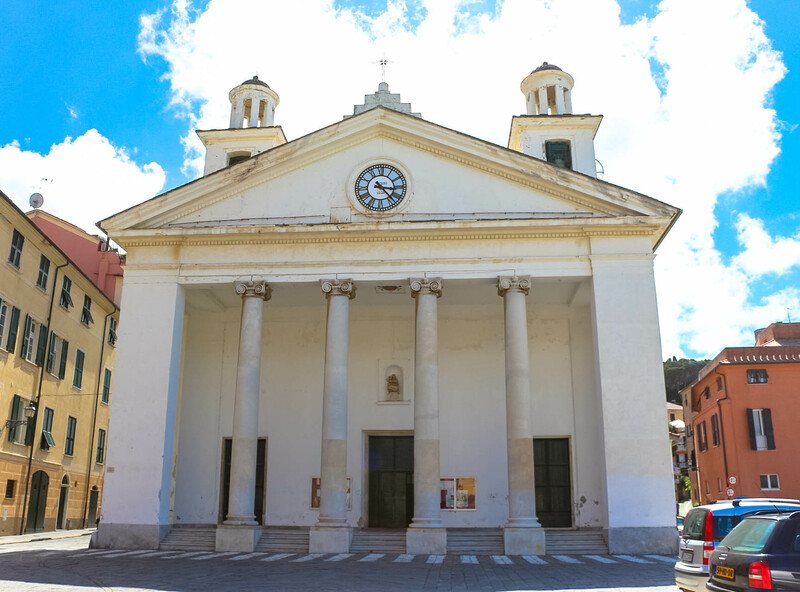 This church was built in the 12th century, altered during Baroque period and later been renovated back to its original look. 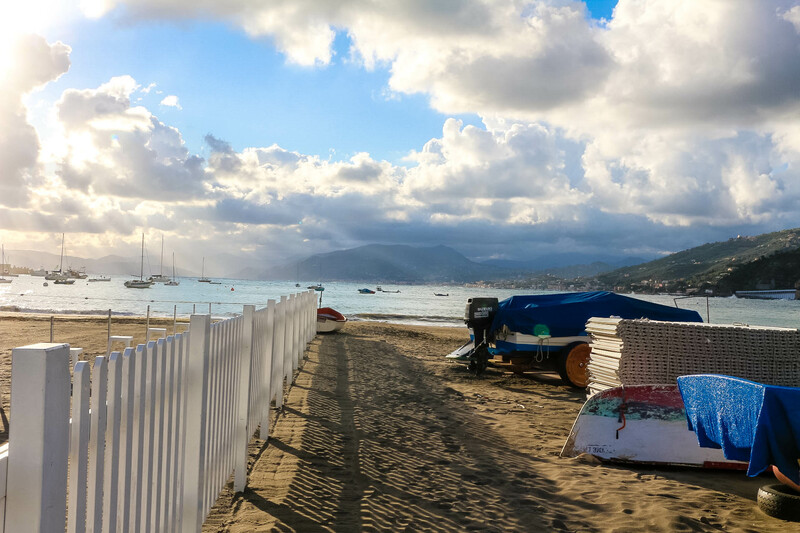 View of the Silent Bay on the other side while walking towards the chic hôtel Helvetia. 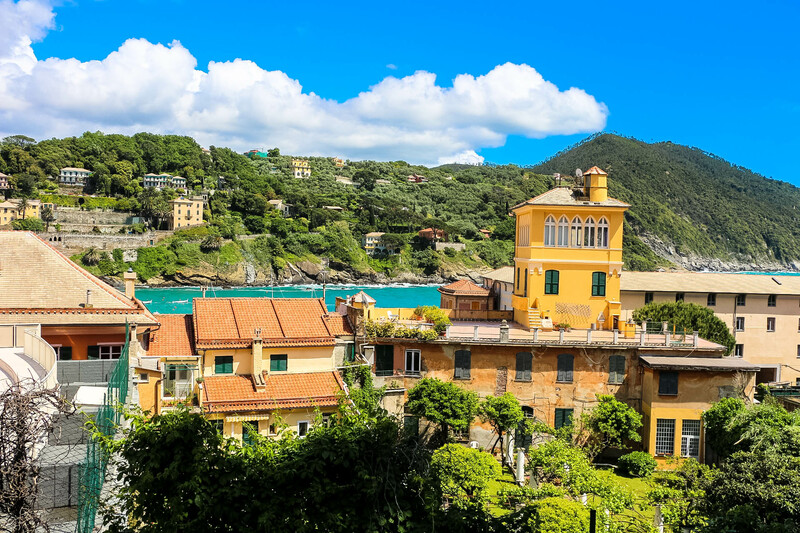 Beautiful view of the villas, bell tower of Church of St Nicolò dell’isola, and the medieval castle on higher grounds. See the shape of the Silent Bay? 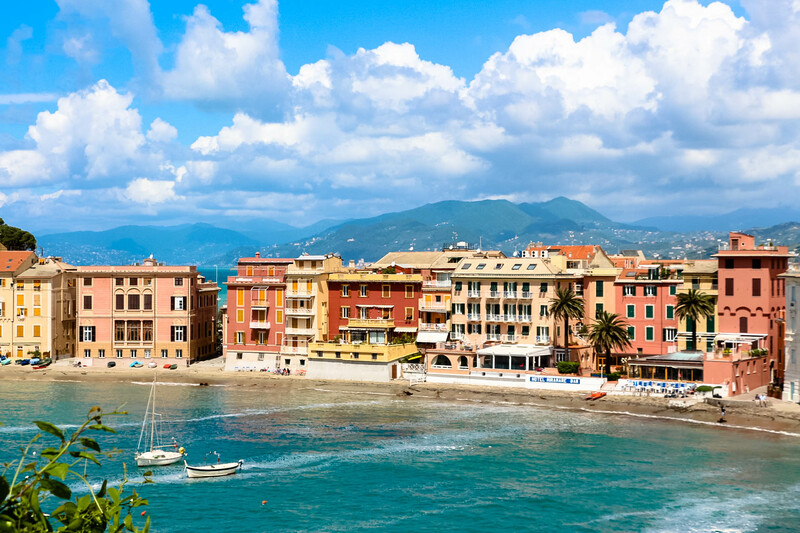 On beautiful weather like this, the colors of the buildings and the sea certainly bring a smile to everyone’s face. A little close-up of the castles above the town. 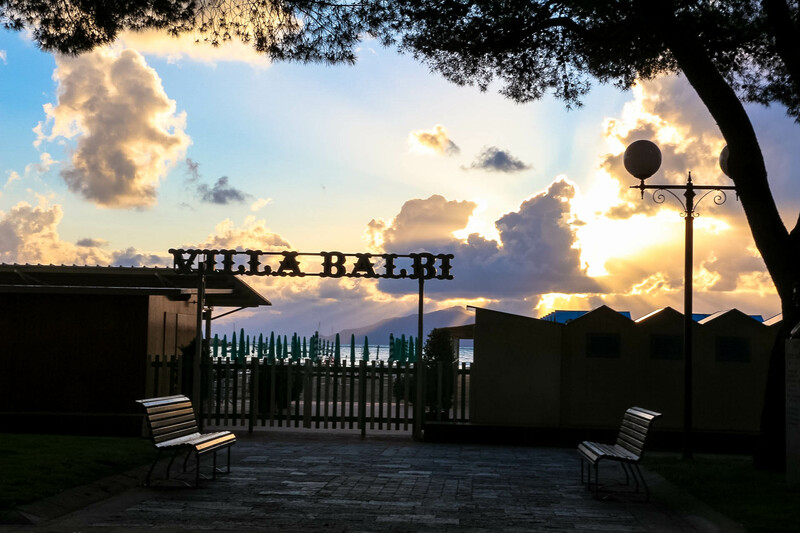 In those days, the village was part of the Republic of Genoa. And like all other villages along the coast, it was subjected to brutal raids by bullying ennemies and pirates. Hence, fortications were built to secure the people living in there. 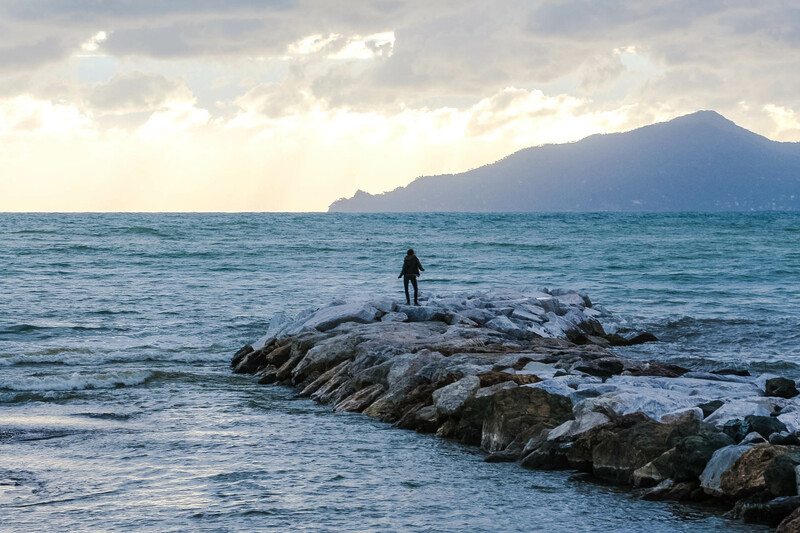 A breakwater that is popular amongst the people who need to let off some sort of pent-up frustrations. With majestic nature unfolding before your eyes, is hard not to resist being at the forefront to feel its powerful force. 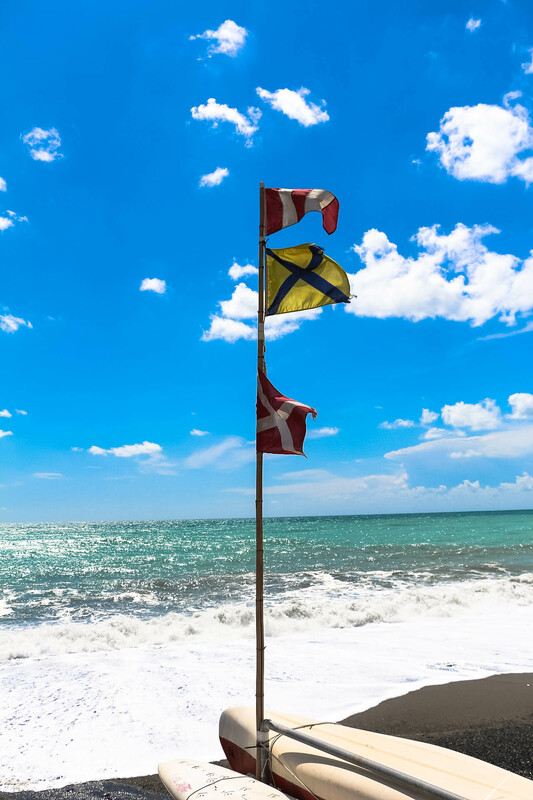 Go ahead, shout out loud and let the sounds of the waves carry it away from you. Come on, honey, let’s turn back. Let me go ahead of you, don’t be afraid. Be careful, is very slippery. 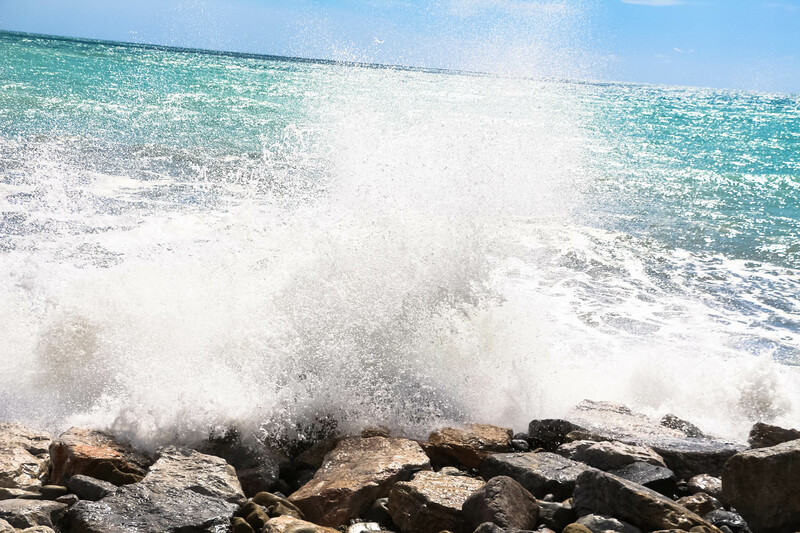 The waves are hitting over the breakwater. I am coming! Wait for me! Take a photo of me, please? This breakwater is certainly very popular with the people! Isn’t it lovely? The sunset beyond the horizon and the waves that hit the shore. There is a pathway that leads past Hotel Helvetia and up the hill where some villas are located. From a higher altitude, this is the view of Silent Bay. Picturesque, isn’t it? Certainly from a higher ground, the view does get farther and better. Beautiful flowers growing on the slopes of the hill. 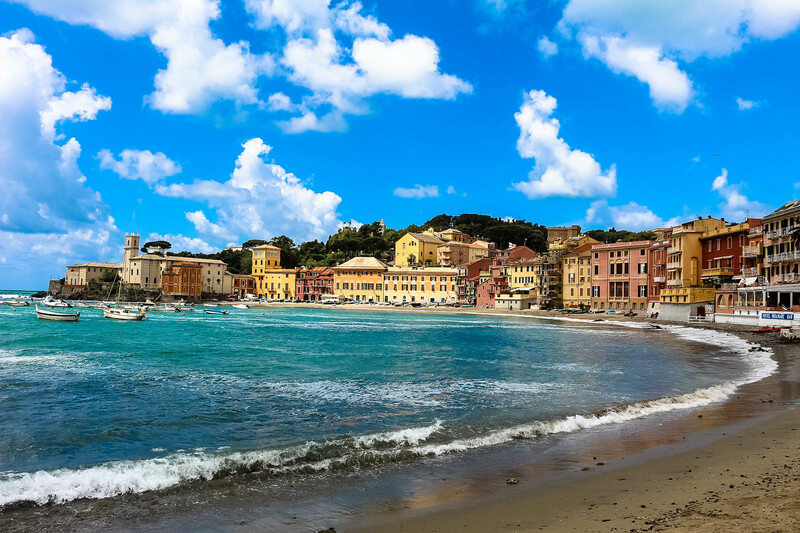 Here is the whole view of Sestri Levante and Silent Bay. The pathway is very easy to walk, that is not too steep, and there are benches at the sides for you to stop, sit and enjoy the scenary or even have a picnic there like I did! 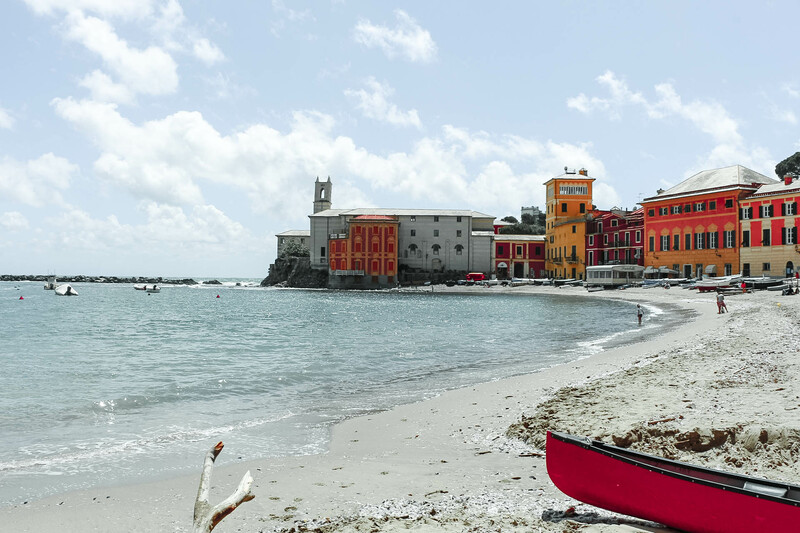 The eternal icon of Sestri Levante, Il Leudo, the last sailing leudo in the Liguria région. It was built to transport cargos, and be towed and be ‘parked’ on the beach of Bay of the Fables. 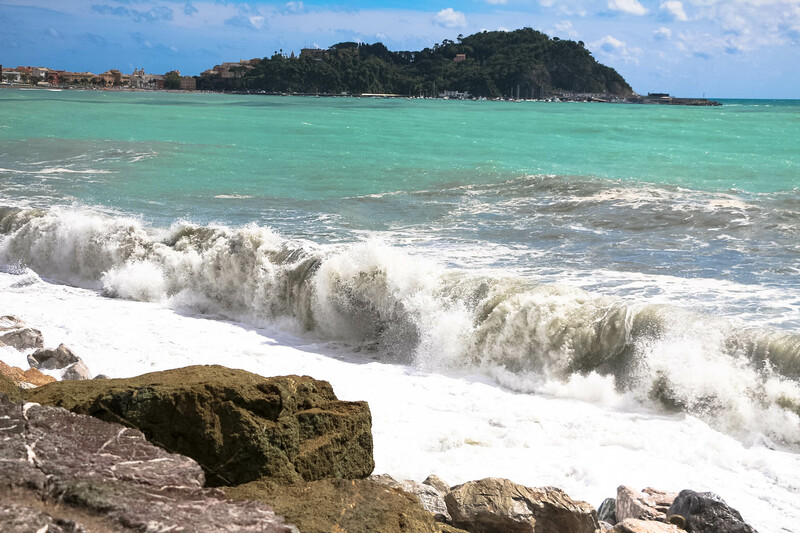 Walking away from the old town of Sestri Levante along the Bay of Fables westwards and enjoy the rushing waves as they hit the shore and the rocks. Sky so blue with clouds like cotton wool, water so green and the rocks so brownish grey … so close your eyes and feel the nature. Is so therapeutic. Hit me baby one more time, as Britney Spears sang in one of her hit songs. 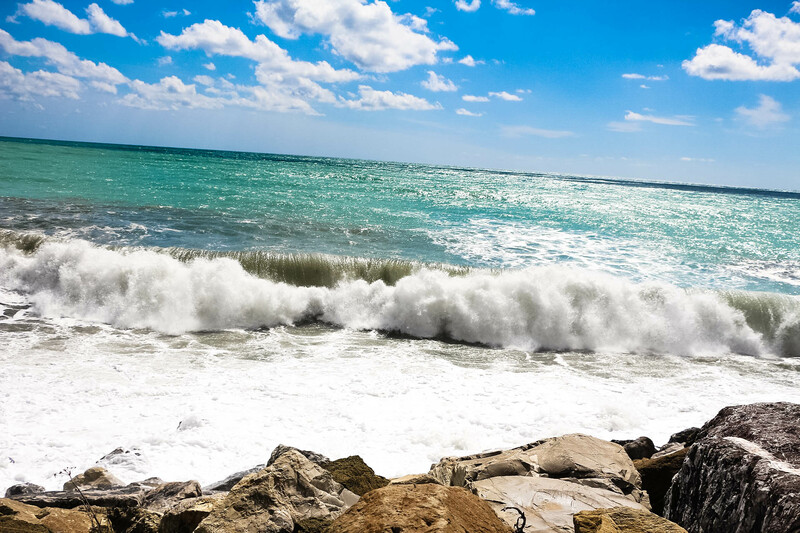 I was taken aback by the forcefulness as the waves crashed onto the rocks. 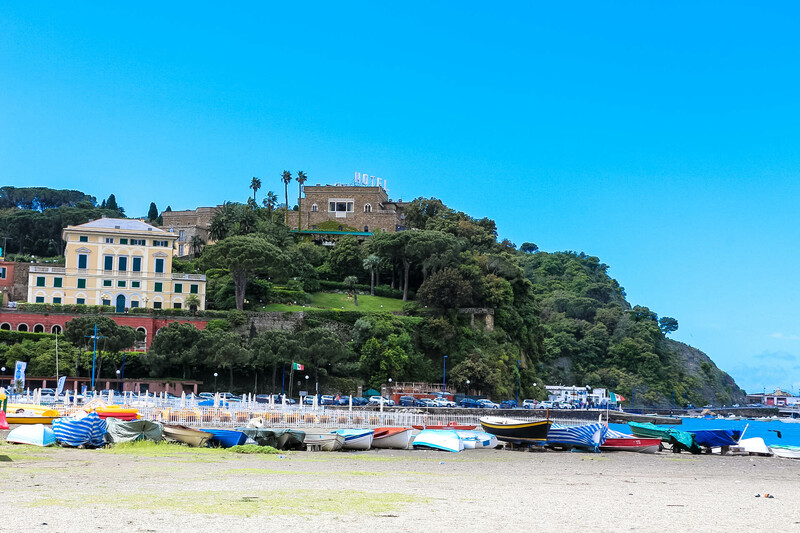 Sestri Levante has many good trattorias that will whip up your appetite! 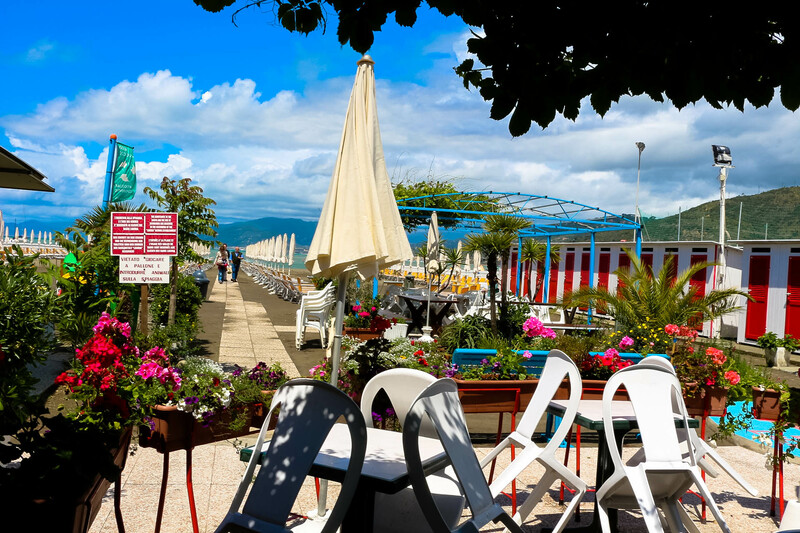 This trattoria which is along the Bay of Fables, which was the only one which was still open at 3pm . Who would have thought that it serves one of the most spécial and delicious spaghetti alla marinara in a sauce that tasted like curry! HEAVENLY! Good news? I finished them all! 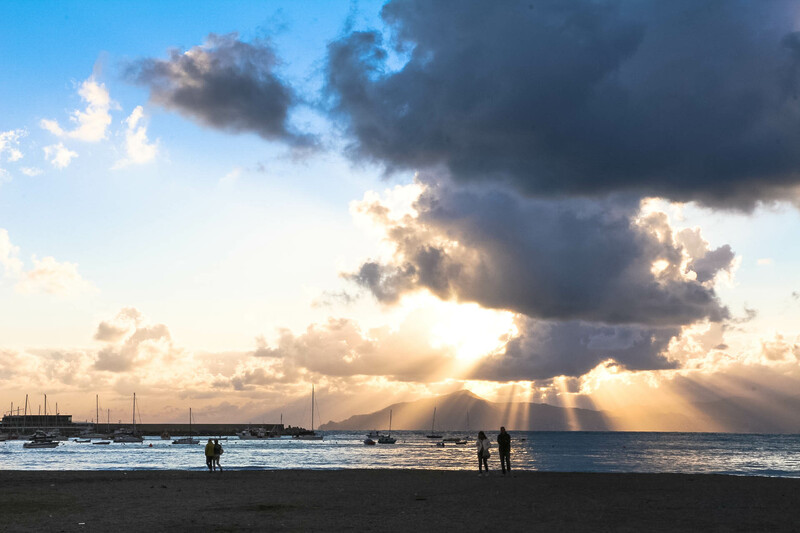 Sunsets is one of the prettiest on the coast of the Mediterreanean and here at the Silent Bay and Bay of Fables, the moment is simply magical. Back again to the Silent Bay as I was told by my host that it is the most magical during sunset hours. And I could not agree more. Such a difference between morning when the sun is out and high as compared to the near setting of the sun. Yes, I prefer in the evening. There is some sort of magic with the sun behind, creating a glowing effect on the colored buildings and the glimmering waters. See Helvetia on the walls that lead upwards the hill? 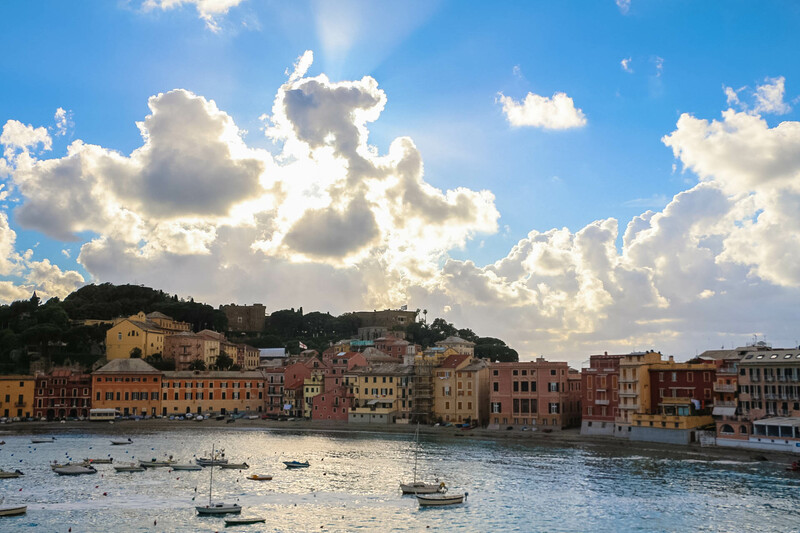 Yes, that is the path that you should take to go upwards to catch a bird’s eye view of Sestri Levante old town. 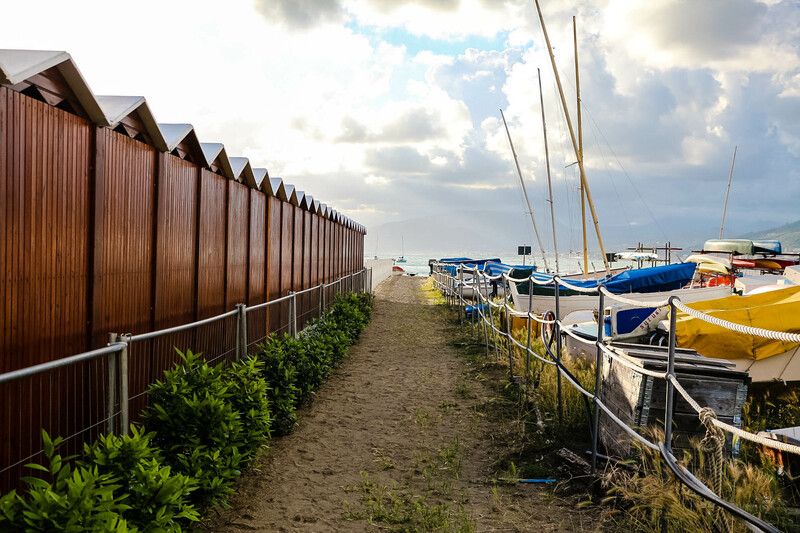 So many ways to keep the fishing boats on the shore. 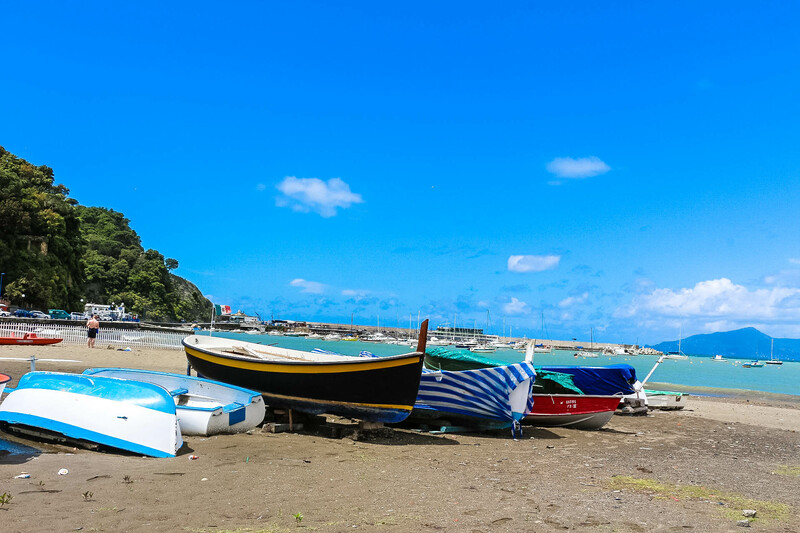 The beach over at the Bay of Fables is definitely more spacious, hence alot of fishing boats are parked here, and where fishermen mend their nets. In each scene I noticed footprints in the sand. Sometimes there were two sets of footprints, other times there were one set of footprint. 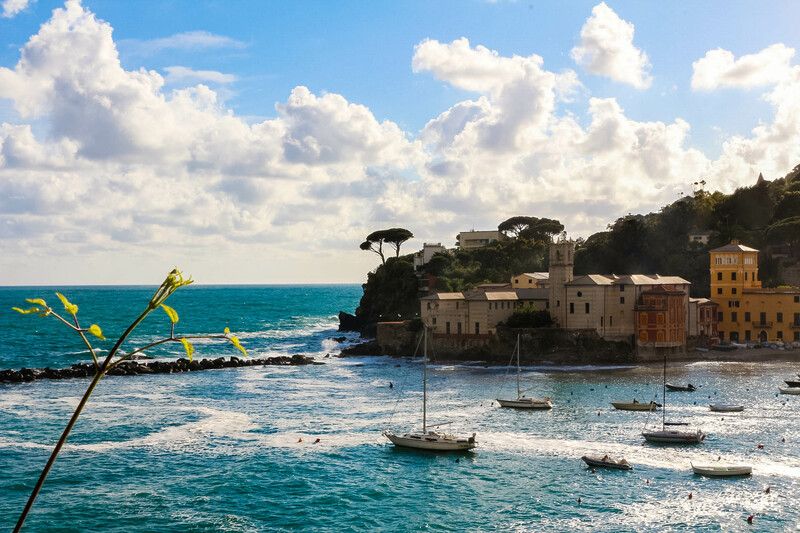 The beautiful ancient castle now hotel dei Castelli above offering unobstructed views of the Meditereannean sea and the towns westwards. I could not resist not taking this moment. So carefree and the man was like trying to catch a crab perhaps? 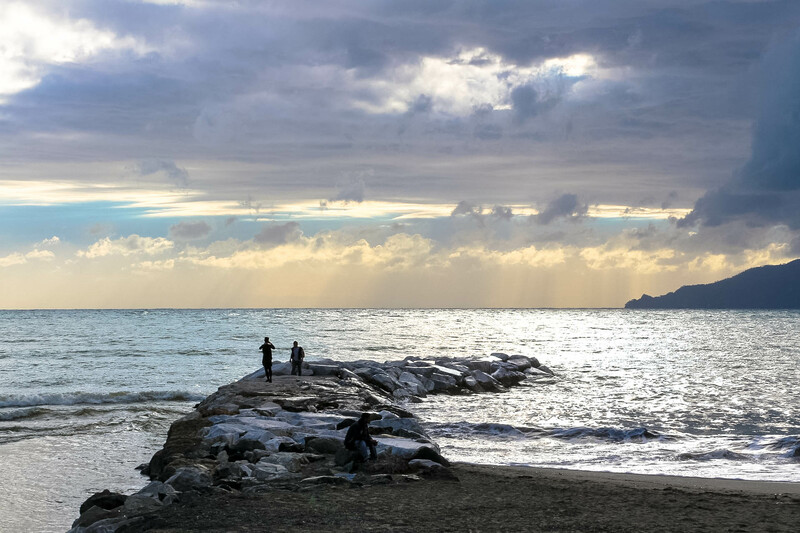 Baia celle Favole or in english as Bay of Fables was named in honor of a Danish writer, Hans Christian Andersen, who is known for his fairytales such as ‘The New Emperor’ and ‘The Little Match Girl’. 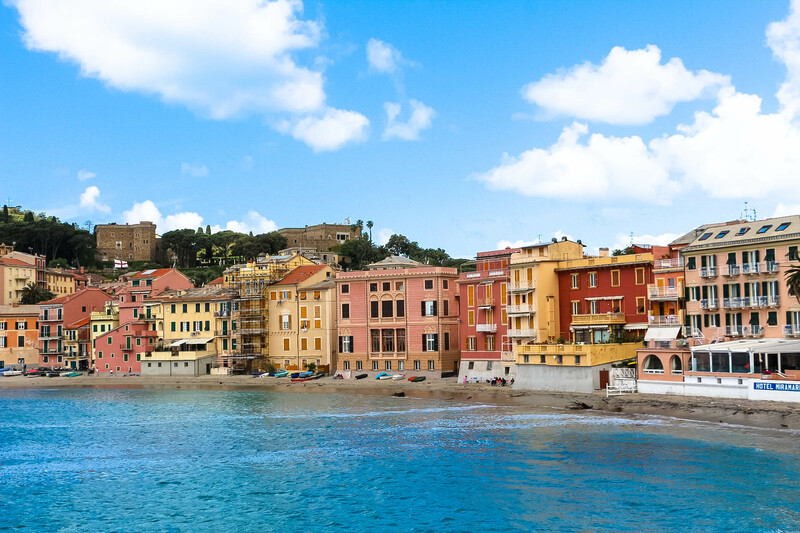 He lived in Sestri Levante briefly in 1833. What an apt name! The view before me does seem like a perfect setting for a fairytale or a painting. A pity I did not bring along my painting materials. 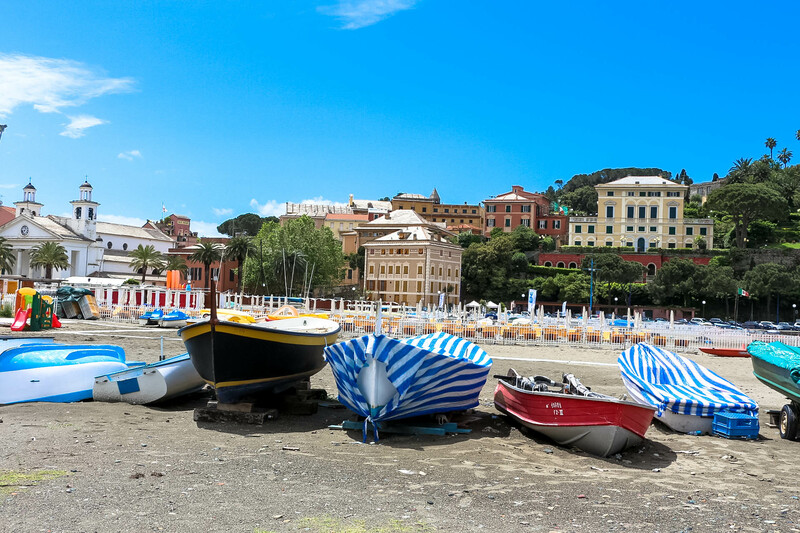 Sestri Levante residential area from Bay of Fables. Behind them is lush green vegetation on the mountains. How nice to be living here, surrounded by nature! 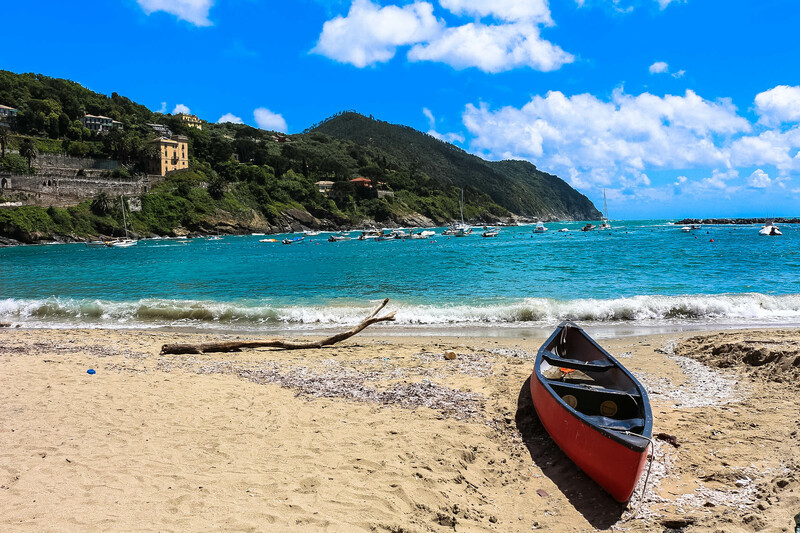 If you are in for some fun at the sea, can give canoeing a try. Doesn’t this feel like heaven is opening up? 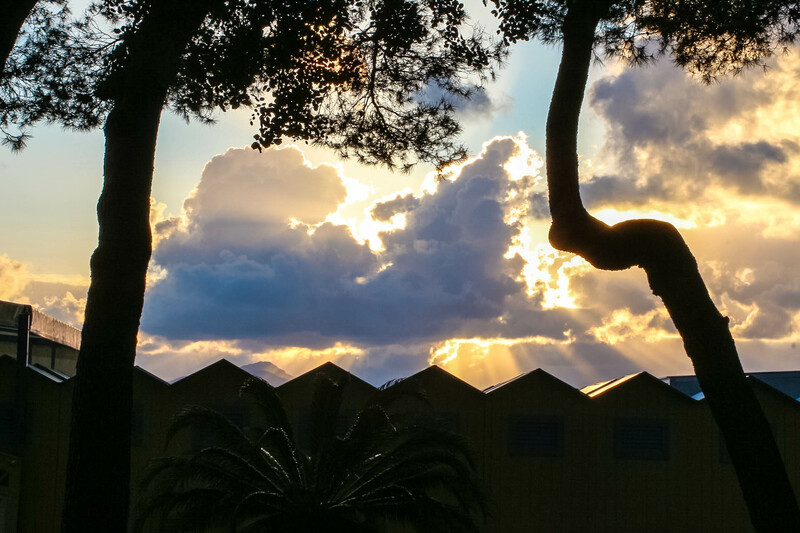 Could there be an angel hiding behind the clouds? Such beautiful sunset moment. 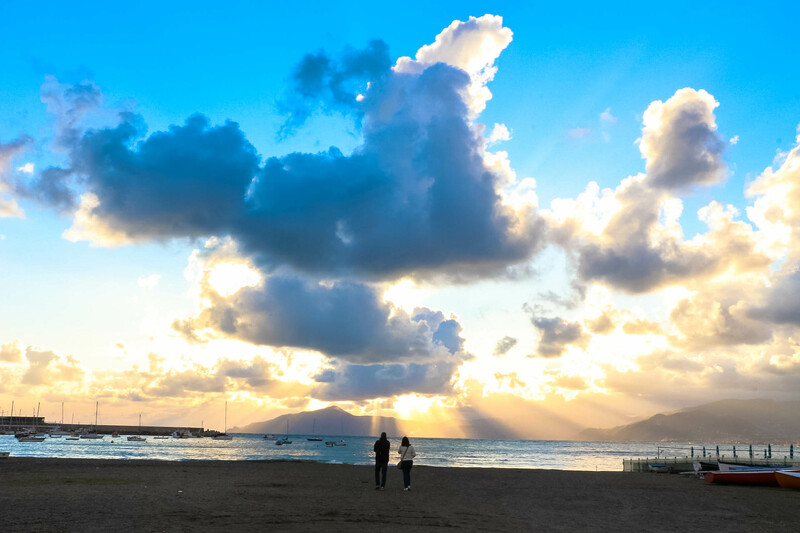 This is when I see more couples walking along the beach, enjoying the scenary before their eyes and each other’s company. Romantic! 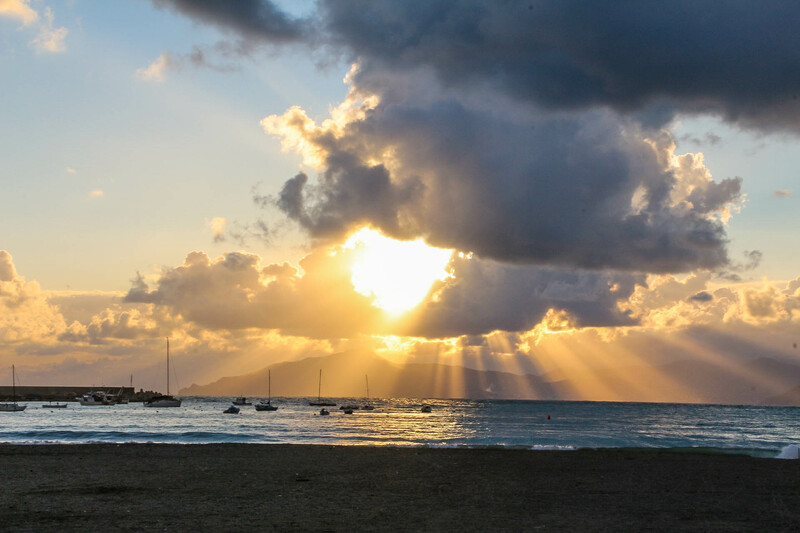 The setting sun illuminating the mountains beyond and the waters glimmer like they are dancing under the last of sun’s rays. I thought I was able to get a cocktail or 2 and have my dinner here, but it was unfortunately closed. 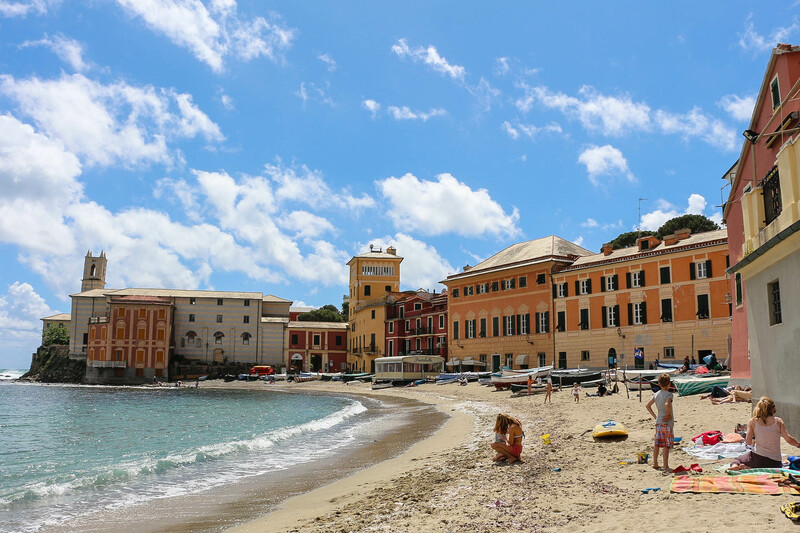 Yes, I was sad to leave Sestri Levante. But I will be heading to another town that offers a different flavor, which is just about another 40mins train ride away.